As you know, Life Is Art was involved in the launch of the ‘Leah Arts District in Hialeah, with a large crowd of very happy people. We are excited to be involved in bringing the residents more arts. 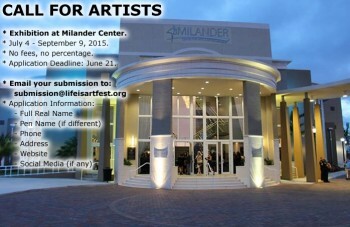 We just had a really short-notice opportunity come up for a two month exhibitionÂ at the new Milander Center in Hialeah. The debut night is during the massive 4th of July Celebration, which brings in thousands of locals. The exhibit will hang until September 9th. The Milander Center hosts numerous events, so your work will get quite a lot of viewers. Each piece will have a label with contact instructions for purchase. There is no fee to apply, no fee to participate and no sales percentage. You keep 100% of your sales. Full Real Name, Pen Name (if different), Phone, Address, Website, and Social Media handles (if any). The website must include images of your work. Entries must be submitted by Sunday, June 21st. Submission does not guarantee inclusion. Life Is Art will contact the chosen artists via email on June 22nd. Installation starts June 30th. Further information regarding installation and other conditions will be emailed to the selected artists.